When Cathy McKnight asks hundreds of tech-savvy marketers this question at the Intelligent Content Conference, many heads nod. And there’s a good reason. As a one-time SAP coder who co-founded and now helps lead the enterprise consulting practice Digital Clarity Group, Cathy understands the content-technology overload marketers face. She knows large organizations’ content-tech stacks have many parts: marketing automation, analytics, content management systems, digital asset management, and so on. Yet, when she asks the ICC audience, “How many of you have a martech-stack strategy that talks about integration and team and training?” only one hand raises. Would you have raised your hand? 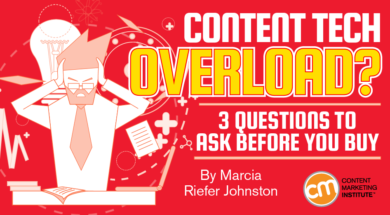 If your hand is still at your side (or even if it isn’t), stop asking for or accepting new content tools or technology until you answer these questions, derived from Cathy’s ICC talk, Content Tech Overload: Four Pillars and Five Tenets of a Successful Content Technology Strategy. 1. Do I understand what’s available in the content part of our martech stack? 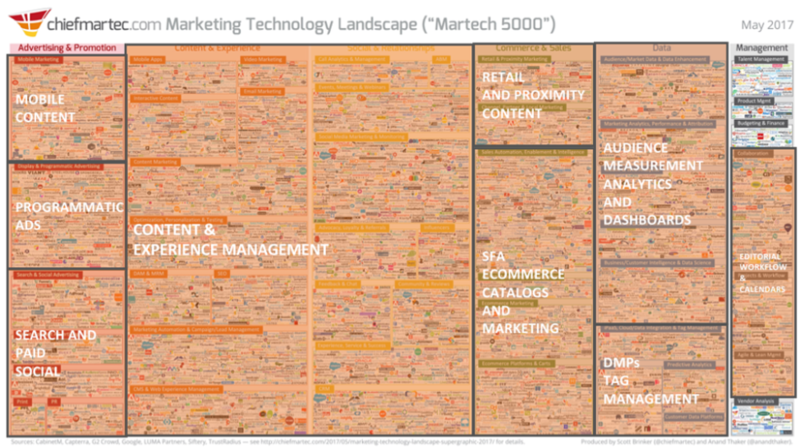 You may have seen this image, which shows the ever-growing landscape of marketing technology. 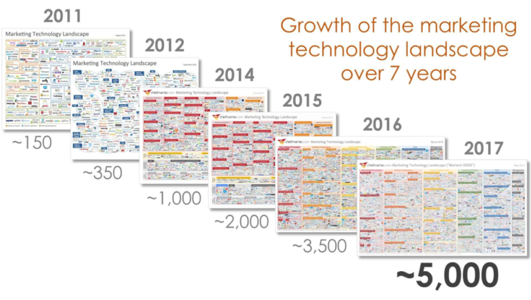 Here’s a close-up of the 2017 Martech 5000 chart, which shows over 5,000 logos grouped into categories. Cathy highlights in orange all the categories that affect content professionals – nearly the whole chart. Even marketers who “never want to get any closer to a piece of technology than the keyboard in front of them to enter content” need to understand which pieces of technology affect the content. If you don’t understand how content experiences are getting delivered to customers, you can’t make strategic decisions. Reaching across department lines and working regularly with people on other teams that relate to content technology can help make sure you’re getting the most value from existing and new technology investments. 2. Does the team have the skills to use the tools? To make your content sing, Cathy says, you may not need new or top-of-the-line technology. You need top-of-the-line teams, including marketing, editorial, IT, and maybe business intelligence, administrative, and others. Those teams need the skills to use, support, and integrate your content technologies with other parts of the business. “Skills aren’t just about learning the user interface. They’re not just about understanding how to send a campaign or how to post a blog post. They’re also about understanding how the content works within the technologies: where it’s transferred, where it sits,” Cathy says. Some team members, for example, may need training to gather and use data to make their lives as content providers easier and to enable your content to reach more prospective customers. Do a skill-set audit to find out what people know how to do and their comfort level in using each technology. What training is missing? What would they like to learn to do? “You may discover that someone in an analytics role or other technical role is super creative and would like to help generate some of the social content,” Cathy says. In addition to helping with planning for tools and technology, a skill-set audit provides a strategic benefit when it’s time to hire someone. “Wouldn’t it be great to understand the gaps on your team so that you could bring in people who can fill those gaps?” Cathy says. 3. What’s our content-tech strategy? “Oooh, we want that. We need that!” New technology – whether it’s right for you or not – can be tantalizing. Vendors may want you to believe that without some shiny new thing you will fail. If we bought that functionality or tool, could we adopt it? Are we in a position to use it the way it’s intended? Do we have the processes? Do we have the skill sets? Is now the right time to acquire it? Can our technology already do those things? Will it help us meet our corporate goals? After you answer these questions and others like them, plot a technology road map. Maybe you’ll map your way to buying a shiny object or maybe you won’t. You may find you can achieve what you want to achieve by adopting new features, functions, and innovations within your existing stack. To create the most useful road map, get over your fears or insecurity around technology. “Be the one who can go to your IT department and say, ‘I heard that our CMS in the next release is going to have x functionality. I think we could use that. Are we in a position to adopt that?’” Cathy advises. Frazzled. Frustrated. Confused. Those are the words Cathy uses to describe today’s marketer in relationship to technology. Tools hamper us even as they enable us. Stepping back and thinking strategically about all those tools can make all the difference. Get to know the parts of your martech stack that relate to content. Audit your teams’ skills – and address the gaps. Form partnerships with other teams. Help create a content-tech road map. Measure before you act (and think before you measure). As you do these things, you’ll be well on your way to developing a content-technology strategy that could inform your company’s technology purchases for years to come. Create your road map and then learn about the shiny new objects (and a lot more about content marketing) at Content Marketing World Sept. 4-7 in Cleveland, Ohio. Register today using code BLOG100 to save $100.